Can You Demand an Apology? You can certainly demand an apology. Truth be told, you can ask for anything you want. But will you get what you want? Not always. Have you ever received an insincere apology? A classic line is: “I’m sorry if you were offended.” Depending on the context, these words can feel empty, meaningless, and even sarcastic. That person is glossing over his or her responsibility, and instead making it about your feelings. For a more tangible example, let’s look at Mel Gibson’s apology after his anti-Semitic rant back in 2006. He released a statement that said he wanted to apologize “to anyone who I have offended” and “for any behavior unbecoming of me in my inebriated state.” He deflected responsibility and blamed this actions on alcohol. How many times have you heard the phrase: “Never apologize. It’s a sign of weakness.” Some people fundamentally wired to avoid any admission of guilt or fault. Asking them to apologize, even if they are clearly in the wrong, is like asking a politician to tell the truth – it’s not in their nature. This situation can be incredibly frustrating, but is there anything to be done? Is there a way to demand an apology? Merriam-Webster defines regret as “to be very sorry for.” We’re often told “don’t do anything you might regret later.” When we regret something, we are wishing that we hadn’t taken a particular action. Sometimes, that action results in someone else getting hurt. Generally, though, the feelings associated with regret have little to do with other people. Instead, this feeling is better expressed as “I wish I had not done that.” People who refuse to apologize may feel regret, but they won’t vocalize it. Remorse, on the other hand, is defined as “a gnawing distress arising from a sense of guilt for past wrongs.” Someone with remorse is ready to admit his or her own mistakes and take responsibility for the action that caused pain. These feelings can lead to a real, full-fledged apology: “I’m sorry I hurt you. What can I do to make it right?” Interestingly, an obsolete usage of the word of remorse is “compassion.” It is compassionate to make amends for hurtful actions and words. That is the difference between regret and remorse. When you regret something, typically, it is for selfish reasons. Conversely, remorse stems from empathy. When you feel remorse, you want to make amends and change your behavior to avoid hurting others. A remorseful person will offer a sincere apology when they screw up. But those who feel only regret are less likely to offer a meaningful apology, even if one is requested. This dynamic points to a larger question: is it worth it to demand an apology? Many parents, for example, demand apologies from their children or force children to make apologies to others. However, if the person apologizing doesn’t feel remorse for their actions, then what is the point? It’s a hollow gesture. You can certainly demand an apology. Truth be told, you can ask for anything you want. But will you get what you want? Not always. An apology isn’t based on how hurt you are, but on whether the other person understands how you feel, and is willing to make amends. In demanding an apology, you circumvent the process of that person’s self-reflection. They probably won’t discover any new feelings of remorse if you’re trying to squeeze it out of them. Instead of making demands, a better approach is to go to the person who hurt you and explain how you feel. Let them decide how to respond. If they choose to apologize – great! If you have to force them to say sorry, they won’t learn anything from the experience. In the end, a person who doesn’t feel remorse is probably not worth spending too much time with. If you need to ask someone to apologize, just forgive them, because they obviously don’t understand the message of Jesus, and need all the help they can get, lead by example and show them the way. Why? If you did/said something you meant it at the time, crying and saying you’re sorry isn’t changing anything, it also shows weakness and stupidity on your part, make sure you think your actions through before you act, simple. Wish that I was so smart and strong to have never done anything for which I should apologize or regret… but, I’m mortal and often desire forgiveness. As the author says, anyone can demand anything they like – but in the long run, the person might apologise, but can you really believe in their sincerity given that you ‘demanded’ that they do it. Sadly, in many cases, I think not. Better to do what William suggested and forgive the person anyway, and then forgive yourself for the pain you have created inside yourself when you felt the need to ‘demand’ something, because you would not get it any other way. I’m SORRY SO SORRY, Please except my APOLOGY, SORRY SEEMs to BE the HARDEST WORD,PERDONAME, WHY if you TRULY BELIEVE YOU are WRONG or a LIAR,take the CASE of TRUMP the BUFFOON who BELIEVEs HE is NEVER WRONG and will NEVER APOLOGIZE,NOW theres a MANIMAL, ORAGUTAN to BE EXACT. But .. can we leave out the Trump references. There’s enough of it on the television .. and I live in Australia. Thank You ANNA, for the MUSIC COMPLIMENT and the HEADs UP on TRUMP, SORRY ! Offence is always taken and hardly ever given when it is related to what people say. Offence in the case of actions is different.. Neglecting to do something or doing something that results in physical harm is something that demands an apology. Being offended about what has been said is often just in the eye of the beholder that perceives harm. Some people are just too thin skinned to live up to the same standards of reasonable offence then others. This is especially the case when it concern religion. Here the perceived offence can reach insanely offensive heights, I just need to point out what happened to the Danish cartoon crisis. An excellent example that excessive offence was taken without it was really given.. The most offended were those that had not seen the cartoons, and went insane just on hear say. The islamic response of not allowing to draw pictures of their prophet is something that is inherent to their religion.. The offence in drawing the cartoons is not in the drawing, but the childish over reaction and the demand of people that are not muslim to adhere to islamic religious dogma.. So the offence should lie on the side of the people that were threatened for drawing the cartoons. But most religions tend to hold hands on the side of being professionally offended instead of rational evaluation of the situation, as can be shown by the fact that most offence was taken in countries christian and muslim that had not printed the cartoons and therefore were offended by the default of hearsay.. Pathetic, short-sighted and small minded in my view.. In a world where religions demand non believers of the faith to adhere to their silly traditions and dogma’s the religions reinforce excessive offence, aggressive response and even violence to the freedom of speech of other that are not part of the faith and ridicule ridiculous aspects of the faith..
.Living in Denmark I know exactly how that went.. As many of the Danish muslims had seen the cartoons nearlæy all were not offended, except for a a small group of Jihadists that decided to incite the middle east.. over half a year after the cartoons were published.. So ignorance and cowardliness of the west led by the christian churches is what led to the destruction of embassies and the murder of muslims in the middle east ans Pakistan..
Yeshua ( Jesus ) do in this situation?” Would he apologize? Apologies are made out of love for our fellow man. We cannot demand love, we can only earn it! May the love of Yahweh be with us all at all times! rabbi jim here: Greetings Memirsbrunnr! Is Denmark your homeland, or, are you American just living there? Just curious. I enjoy meeting foreigners. May Yahweh bless you and keep you faithful and safe. Shalom!!!!!! I was always taught to accept an apology, no matter how brusque, walk away, and leave it there. No one has the right to not be offended, that is surely a matter for oneself, take the apology, or lack of apology, and let it go…. to show your gratitude for their apology. Then, offer your eternal friendship to them in return. Cement the situation. Lets all practice good common sense in dealings with others. My Yahweh bless you and keep your soul safe and pure. Shalom!!!! rabbi jim here: Greetings again. I must apologize here for all of my typing errors. I seem to be hitting the wrong keys, often. I’m SORRY for that. Please, forgive me and feel free to correct me when it happens. May Yahweh bless all who read this and keep you safe. I think sometimes that an apology is a polite social grace. I do not think it is a thing to be demanded, unless a person is on a power trip to get an insincere social grace as a sort of notch on the belt. 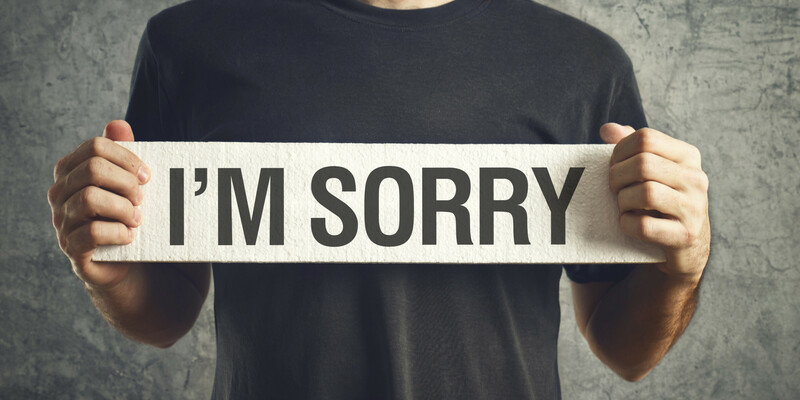 It is better to do “I’m sorry” than to say it, but sometimes even though a person truly isn’t feeling it, a social grace of an apology can allow all parties to move on from whatever incident sparked the ill feelings. So, in that context, an apology is a form of good manners. Sometimes a superficial show of decency is better than none at all, but it can indeed be offered in a nasty passive aggressive delivery. Such a delivery reflects poorly on the giver, again in a social grace context. A true apology goes beyond words. Great article! I don’t generally need an apology to forgive, but I cannot forget it. Those who do things that require an apology, especially if its a regularly occurring thing for them to behave that way, then I rather not let them in enough to do it again. If a person is that careless and reckless with their behaviors and attitudes to people they are around then I don’t need them around. It isn’t dislike, it isn’t anger or hate, it just is what it is and I have no time for it. My ex. Husband would lie about many things and never apologize when confronted about it , I have studied ACIM for many years , and it came down to the truth , actually he did not want to change his behavior and it would have been another lie to apologize about it . Ultimately it boiled down to accept him as he was , and move on . He was a Master Teacher for me though , taking it inward and empowering myself with why did I create that in my experience ? Where was I lying , because I always told the Truth and how did that serve me ? It came down to he was a supporting structure in my own Holiness , Special ness , I was more special to God Creator and these lies he told , separated him from God made him unholy etc. , That was my lie , with Judgement, withholding the gift of Innocence that and seeing what I had with God giving / sharing that to my brother , (husband) , friends , humanity . Sometime, even if we are the ones who have felt slighted, or know the relationship is toxic, and feel the need to purge certain friends from our lives, we still need to sweep our side of the street clean, and to know when it is about the other person, and when it is about us. If we take nothing personally, we cannot ever be offended. I say forgive them for they no not what they do and then decide if this is someone you want in your life? If you have to ask for an apology then the person isn’t sorry. So why bother? Just chock it up to experience and move on. God bless them anyway. I am sorry is not a question of forgiveness.Could You please forgive me is the right words…. Then those that refuse to forgive are on the way to HELL. Such moments as catching someone in a lie I think are opportunities, if uncomfortable and painful ones. It speaks well of us to shine a compassionate light onto such moments, keeping in mind that if we’re honest with ourselves it can be very difficult for us to be with truth in every word and deed. But its important for the person caught in a lie to understand that the repercussions extend further than they may think, further than just this moment or that. Let them understand your trust has been betrayed and that we may be forced to put them in the category of “someone who lies to me” (and if it goes on) “often.” Help them to believe that lying in general is just the bad way to go with logic, that if that is how they are going to be then your trust in them is.. lost! It is that simple, truth be told. Of course we should forgive, but that is our side of it, but it seems harmful to forget it, to let it go. We do need to express in these times, as these can be relationship changing moments. Here we need a bright a bright, but compassionate light, clearly showing just how important honesty (our honor to each our and the Divine) truly is to us. Apologies and forgiveness are tied together. Much the same as apologies and lies are closely related, in my opinion. How can we have forgiveness after an apology if the offender is not truly genuine in their remorse? The apology becomes a lie if there is no intent to make a meaningful and lasting change in behavior. But, there is much to consider. There are times when all it takes is a wrong look to offend or upset someone. Others, it may be that their boiling point is much higher. I believe you have to look at both the accused and the accuser to decide the right course of action. If you have someone who has been through some form of real or imagined trauma that effects their daily life, it can be hard to know what will cause upset. And it will be difficult to know how to change behavior in a meaningful way so as not to have the same hurt reoccur. Then if you have someone who is not truly remorseful and doesn’t plan on changing, yet goes through the motions of the apology, then that is a lie. When you value someone and your relationship with them, an apology becomes a responsibility. A promise that you will do whatever you can to make it right. That you will make every possible attempt not to commit the offense again. If you apologize without the intent to make change, then what is the point? A child needs guidance and doesn’t always know when a word or deed is incorrect or offensive. They need to be guided and know that an apology is appropriate. However, I don’t believe that an apology is something you should ask for from an adult. A healthy, mentally and emotionally aware adult, usually knows when someone they care about it hurting. Occasionally they do not. If after becoming aware of the pain, and they know that it is reasonable, they have the responsibility to act and apologize. If they do not, then asking for an apology will be hollow, meaningless…a lie. Demand an apology? What would it accomplish? We know that we have passed from death unto life because we love the brethren. He that loveth not his brother abideth in death (I John 3:14). We have the Holy Spirit within us to help guide us in things such as apologies. If your feelings are hurt then examine what your thoughts are; maybe the other party drug up something unfinished in your life. If they are pernicious in their acts then dis-associate yourself from them. When all else fails ask Jesus to help guide you and accept a unspoken apology. Not everyone can express remorse effectively. If the person is a repeat offender let go, move on and hopefully this person will eventually recognize this flaw. It will bring relief and joy for all. If Jesus is not your source for guidance go to your higher power. Have a beautiful day!